It is one of the most important works of Shankaracharya on Advaita philosophy. The central theme of the book is the identity of the individual self and Universal self. This identity is realized through the removal of the ignorance that hides the truth, by the light of Vichara or enquiry alone. To those who have neither the time nor the opportunity to go through the classical works of Shankara, this book will be an invaluable guide in their quest after spiritual truth. 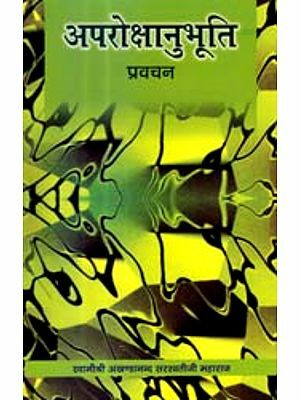 Such treatises as aim at serving as introductions to a more advanced study of a system of philosophy are generally known as 'Prakarana Granthas' Besides giving an outline of the system, each of them emphasizes some one or other of the main features. 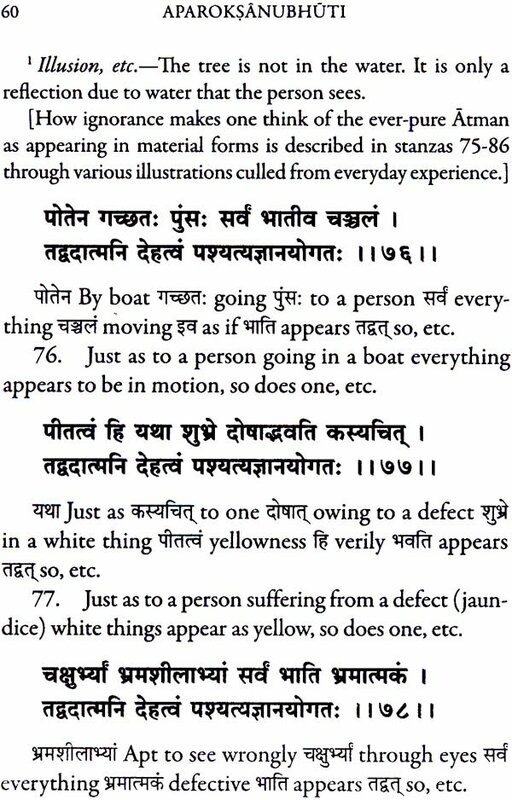 Aparoksanubbuti is one such little manual, which, while presenting a brief description of Vedanta, deals specially with that aspect of it which relates to the realization (Anubhuti) of the highest Truth. Such realization, unlike the knowledge of objects through sense-perception or inference, is an immediate and direct perception of one's own Self, which is here indicated by the word .Aparoksa. 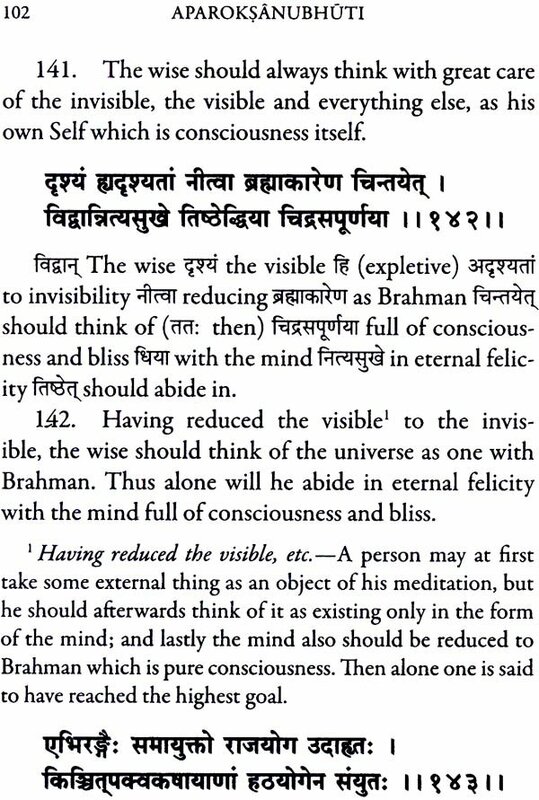 The central theme of the book is the identity of the jivatman (individual self) and Paramatman (Universal Self). This identity is realized through the removal of the ignorance that hides the truth, by the light of Vicenquireara or enquiry alone (verse 11). To enable the mind to embark on such an investigation into truth, certain disciplines are laid down, which are not peculiar to Vedanta, but are indispensable for all such enquiries into the highest Truth. The book then gives a description of one who has attained this realization and of the nature of his life. 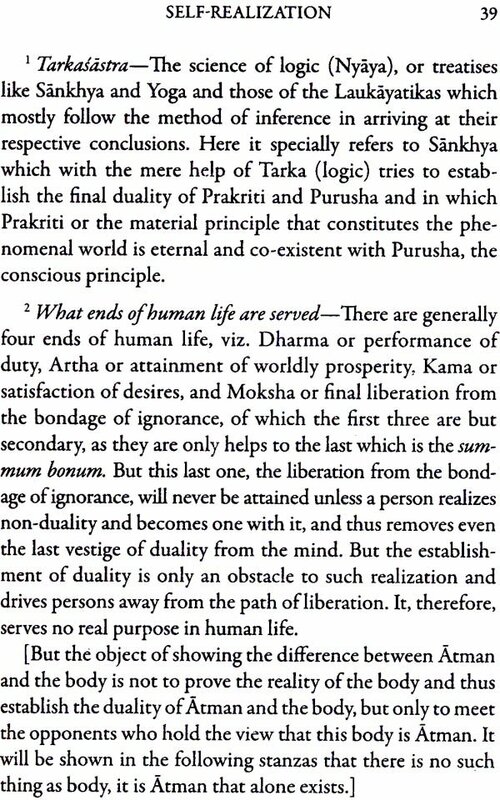 Then follows a discussion on Prarabdha, the momentum of past actions. The author contends that after realization, when ignorance with all its effects entirely disappears, the question of the survival of the body for working out Prarabdha is altogether out of place; and the Shruti sometimes speaks of it only to explain to the ignorant the apparent behaviour of a man of realization, who, so far as he himself is concerned, is ever immersed in the Supreme Truth. Verses 100 to 129 deal specially with the fifteen stages through which the seeker after Truth passes- which, by the way, are similar to those experienced by a Raja-Yogin: but the two are entirely different. 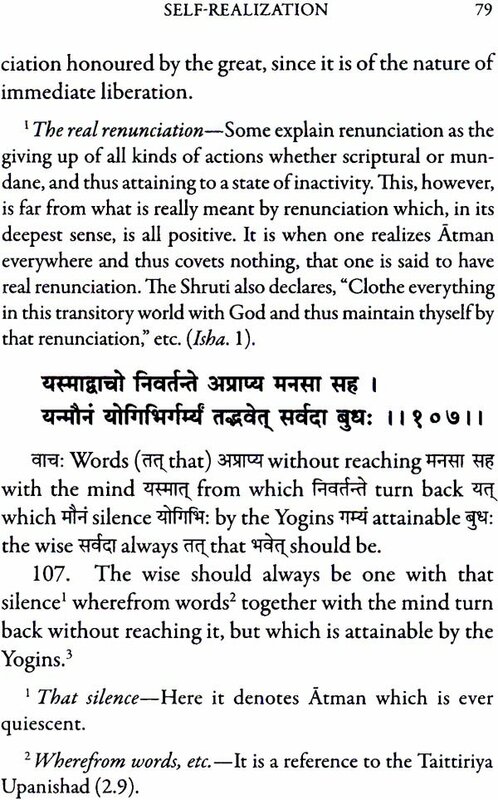 Then is the oneness of cause and effect-the Absolute and the manifested universe-which is wound up with the culminating thought of the Vedanta philosophy that all that is visible and invisible is in reality the one eternal Atman, which is Pure Consciousness (verse 141). The authorship of the book is generally attributed to Sri Sankaracarya, Even if this be disputed, the teachings are undoubtedly Advaitic. To those, therefore, who have neither the time nor the opportunity to go through the classical works of Sankaracarya, a treatise like the pre- sent one will be an invaluable guide in their quest after spiritual truths. It may be mentioned here that verses 89 to 98 occur with slight variations also in the Nadabindu Upanisad (21-29) and verses 102 to 136, 140 and 142, in the Tejabindu Upanisad (15-51). Translations of the book into English and some Indian vernaculars have already been published. But the need having been expressed by some beginners for word-for-word equivalents and notes in English, a fresh attempt is being made to meet these require- ments. The author acknowledges his indebtedness to the existing translations as well as to the commentary of Vidyaranya. It is hoped that the book will be of use to those for whom it is intended.